Midlife women are inherently geared towards pleasing other people. They put themselves second to their families, to their friends, to their work colleagues, to their parents, and to goodness knows who else thinks they're entitled to be looked after. It's time to stop doing that, it's time to stop putting everyone else's needs ahead of your own. That doesn't mean becoming selfish or losing your compassion. It doesn't mean that others can't be given priority when the situation calls for it (illness, crisis, loss, or immediate need). What it does mean is that you're allowed to make yourself a priority. It's important to offer grace and goodness to other people, but to continue to do that you need to fill your own well, you can't continually give out if you have nothing to give from. You need to practice self-care and to make your own needs a priority. It's okay to take some time for yourself, to do things that you enjoy rather than being at the beck and call of your family, friends or acquaintances. It's not selfish to look after yourself and to make yourself top of the list more often. Learn to say "No" if you're being drained, learn to release others from depending on you always being available, and learn to offer yourself the same grace you give to others. This can be a big one for women. I read the other day that women are afraid to walk after dark - well that was no big surprise! Women need to feel safe and walking alone at night isn't safe - no matter how many people say it should be otherwise, it's just a fact. But, there's a difference between living in fear of physical assault, and living in fear of the future or being scared of trying new things, or fearing things we don't understand. We need to have courage, we need to face new challenges head on, and we need to do it with confidence. Confidence is the polar opposite of fear. We need to trust our judgement (we didn't get to Midlife without learning a lot along the way), we need to acknowledge our strengths and to tackle the challenges that life brings our way. For me at the moment, it's what to do after leaving my job. Should I look for something new, should I go back, should I retire? This is a huge change for me after working for the last 40 years - I can let it scare me or I can see it as the beginning of a new adventure, a new life stage, and see what it brings in its wake. Yes it's scary, but I don't have to be paralyzed by that scariness, I can acknowledge it and then move through it - letting fear win is just unacceptable. I've always been an over-thinker - I can overthink any situation into a major big deal with no effort at all. I can read all sorts of motives into someone's actions or reactions and I can leap to conclusions based on these assumptions in one quick jump. This leads on to worrying about the outcome of something that may not even eventuate. It can lead to me lying in bed and thinking about what might happen, what to do if it does happen, how I can cope with that, or try to avert it, or survive it. Quite often what I've worried about and thought to death never actually happens - it was all a waste of brain space (and sleep time). 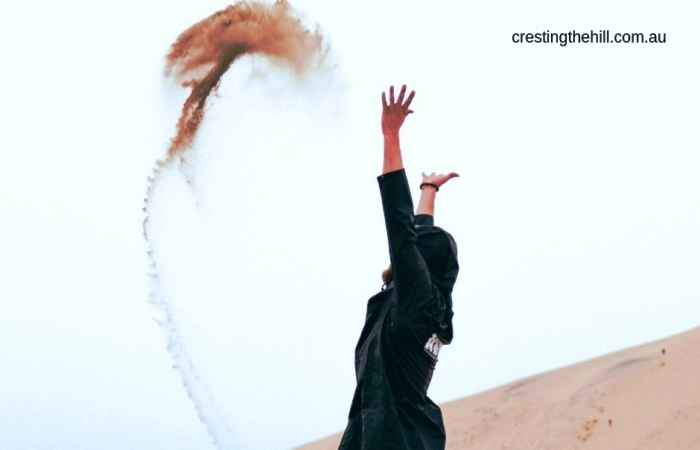 If you're a chronic over-thinker you need to ask yourself "Why?" Is it because you like to feel you're in control? (See Point 5!) Or that you need to have a plan in place for any contingency? I think Midlife women struggle with this a lot because it's a carry over from being "the Mum" where we felt we needed to look after everyone and keep them safe. It's time to let that go, it's time to breathe and to tackle a problem if and when it arises - not to create a problem in your head that probably doesn't exist. Let's all stop for a moment and exhale and start living one day at a time and deal with what today has for us - not yesterday, not tomorrow - and certainly not next year! Resisting change is futile - change happens regardless and we need to decide whether to fight it or embrace it. If you're anything like me, you find change and upheaval really unsettling. But change is inevitable - people change, life situations change, growth happens, bad things happen, life is constantly in motion. If we keep digging our heels in and trying to stay in one place - doing the same things in the same way, we get left behind. When I look back at the changes in my life, even the ones I thought were terrible at the time, they've all led me towards growth - I may have fought to hold on to the old ways a time or two, but once I accepted that I needed to leave a job, or my kids didn't need me to mother hen them, or my husband was going to always march to a different drumbeat than mine, life settled into a new groove and I adapted and moved forward. Nobody wants to be living the same life over and over again through the decades - it's about acceptance and trusting the process - and the end result is always better than we expect. I've admitted on this blog many times that I struggle with letting go of the concept of control. I call it a "concept" now because I've realized that we don't really control most events in life. We hold on tight and we push and shove, but ultimately what will be, will be. As I mentioned in my previous point, change happens and it unsettles us - I hate feeling out of sorts and I have an aversion to my ducks in a row behaving like squirrels! I try to corral them into a semblence of order so I feel like I have control, but really all I do is add a bucket load of stress to my life. I've come to see that the only aspect we have any control over is our reaction to our circumstances. The changes and ups and downs happen regardless of how we try to arrange things, so focusing on choosing to be positive, choosing to embrace change rather than fight to control its direction, and choosing to look at the benefits that will result from a life change is the best way to use that desire to micro-manage our situation. A while back I took on the 30 Day No Complaining Challenge and it really made a difference in my life. It turned my attitude around - especially in regard to the work drama I was embroiled in. I realized that I'd been complaining about it, churning it over in my head, and generally spinning my wheels in the sand with no positive outcome. Choosing to stop the constant complaints gave me room in my head to look at it from a different perspective and to approach it from a "how can I improve this" viewpoint, rather than the "I'm stuck in this mess" attitude that I'd had up until then. Complaining gives us a short term release, and it springs from the need to have other people affirm how difficult the situation is for us. It doesn't fix anything, it doesn't bring about change, it just mires us in the depths and prevents us from finding ways out and into a new "normal". Complaining focuses on the negatives and makes us critical - and the more we focus on the bad, the more we see it. If that's what's happening in your world, maybe you need to challenge yourself to stop complaining and start looking for positive and proactive solutions. 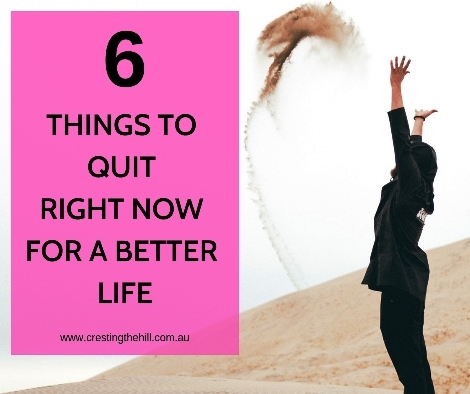 Do any of these 6 things resonate with you? Are there any you need to quit right now? Are there any you'd add to the list? I'd love to know what areas you're working on because we need to be each other's cheer squad and be applauding those who are proactively engaging with life and making themselves "More" in the process. These are ALL GREAT! 2017 I set a New Year's resolution to stop complaining about the weather. Boy did I pick the worst year for that, but it did force me to realize how often I made remarks about the weather and complained. Nothing I could do about it and what was the point in complaining? I have made myself a compromise and declarative statements about the weather are fine but only if limited in quantity! I was telling myself that my complaining was "just making an observation" Haralee - but it wasn't, it was whinging :) I still do it, but at least I'm aware of it more these days and try to pull myself up when it happens. Not being in the job anymore has certainly helped! I can say I've stopped doing most of these. That fear/confidence still tries to sneak in every now and then. Nice to know there's hope for me Doreen - sometimes I feel like I make progress and then fall back again into the old habits. The worry and control things are improving and they were both biggies for me - so I'm heading in the right direction. Oh, you are so right! All great habits to drop. I am only OK with number 4, the rest I need to work on! All of them have been issues for me - some I'm getting better at, others are still on the list to improve. I think being aware of them is a step in the right direction, then consciously pulling myself up and changing my thought patterns is helping too. It sounds like you and I are VERY similar! I love this post because it reminds me that I have been making a lot of progress in each of these areas. I don't always give myself credit for the efforts that I put forth or my own personal growth, so this was a great way to see it and validate ME. Kudos to you too for seeing these things and sharing in a way that is very relatable! I'm glad you enjoyed it Kate - you certainly have a lot going on in your life and I think people pleasing is a driving force for a lot of us. When we take a step back and check our motives and allow a little self care, things definitely slow down a little. I'm getting there too Natalie - I think once I slide into retirement and have less people to juggle my world around I'll find that some of these disappear from my life. Hey Leanne! I love your list! I still struggle with the overthinking, this is where my anxiety kicks in but I'm seriously trying to get better. Change doesn't bother me an extent. As a matter of fact, I welcome it. However, I know in the future I most likely won't be as receptive. I think that's part of growing older, no? Great list! 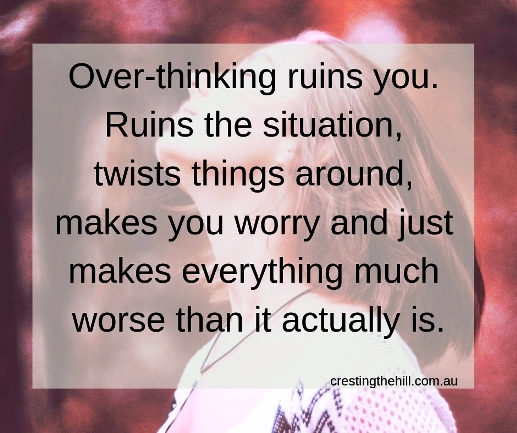 Over-thinking is a killer for me Bren - I'm getting better at recognizing when I'm doing it and re-directing myself before I've created a whole vista of things to worry about. I think dropping my stress levels down will also help - change can be good for moving out of messy situations (like my work one was). Oh my goodness, Leanne, you are singing (yelling?) my song...as in stop these behaviors! I think midlife has slowed down my need for people-pleasing, but I still overthink and worry about certain things, mainly if I have a disagreement with others over something. Probably related to control as well! I have outgrown (I hope) complaining, too, because at this point in my life, I am blessed and have nothing to complain about! A great list of behaviors for us to keep at the back of our minds and learn to let them go! VIsiting from #MLSTL today! You're right Terrii - Midlife has certainly improved a lot of areas for me too. I don't think I'm as controlled by these six as I used to be, but I still notice them sneaking back if I'm not vigilant. 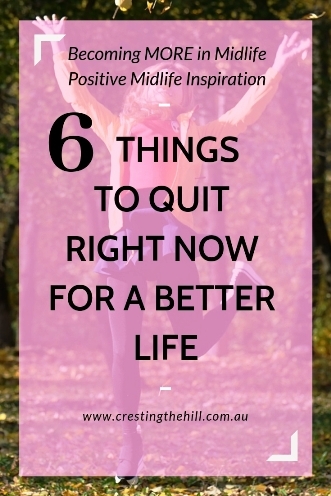 It's so easy to slip into negative behaviours if life feels a bit down but I've also realized that all of these are my choice and my responsibility - so I push through and don't wallow - much better for my soul! Hi Min and yes, overthinking is a big one for me too - and it comes around to control because I feel like if I think something to death then I'll have control of any potential outcomes (including the ones that are never likely to happen!) Change stresses me but it always turns out better than I expect and I'm also getting better at putting my needs first more often and damn the torpedoes! I just love all of these. Thank you for the reminder. Sometimes we can be our worst enemy. I just love your blog, Leanne, and look forward to more! Thank you so much! You need to sign off with your name so I can thank you more personally (unknown is so mysterious!) These areas are all ones that rang bells for me and that I'm working on defeating in my own life - so glad they resonated with you too. I'm an overthinker too Patrick - it seems to be an area a lot of us need to move on from because ultimately it's a pointless exercise - just got to get my brain to figure that out too! Overthinking or worrying is definitely one of my issues and most of what I'm overthinking is in the past. Running scenarios of how it could have been better. Although, I've been know to venture down the path of each of these at various times. Love your duck-less squirrel. That duckless squirrel drives me crazy at time Jennifer - I am such an orderly and organized person and those ducks in a row are a constant dilemma for me. It's a bit like herding cats when it comes to fixing everyone and trying to control everything! Good for you, Leanne for working towards all these positive changes, and inspiring others to do the same. My goals this year, inspired by you and others, in the blogging world, are to be more tolerant, and less critical and judgmental of others. I know that the more confidence I have in myself, the easier it will be to let go of criticism, and judgment. Sharing to FB. Christina both of those struck a chord with me - I too can be quite critical and judgemental (the world is full of idiots is one of my constant remarks!) And you're right, being more sure of myself and being able to offer grace to others would certainly kerb those less savoury areas of my personality. I'm guilty of all these! UGH! Especially worrying, it seems to get worse as I age. Great post! TFS! Worrying has always been a big problem for me Amy - I do have a better handle on it now, but it still creeps up on me. I think it's the fact that I want everyone safe and doing what I expect they'll be doing - as soon as they start having issues, I start worrying - it solves nothing and at least I can see that these days! I am very guilty of over thinking and needing to be in control. I am the oldest child in the family and I took on a lot of responsibility early on in life and I think the control issue comes from that. I have no idea why I over think some things. Victoria I'm exactly the same - oldest child, too much responsibility, always needing to fix people and live in an ordered world. It's amazing how birth order defines us isn't it? Hi Jo - I can tick all six things - at least I can also say that I'm working on them all and doing quite well at defeating some of them. It's so hard to turn ingrained character traits on their head, but when they serve no good purpose then they really need to go. I don't intend to waste the next 30 years stuck in the same old ruts. It's like Sue and me Deb, we're cut from a similar cloth I think. We recognize the same personality positives and negatives in each other. The best part of the story is that we can see it in ourselves and we're doing our best to deal with it and become better versions of ourselves - which is pretty fabulous IMHO! Thanks for this, Leanne! Your thoughts have helped me to be very sure about a decision I just made that counteracts people pleasing AND living in fear! This list resonated with me, particularly control. I'm working on it. The thing I struggle with the most is control. Actually I think hubby and I both do at times, that's probably the issue that's at the heart of our occasional spats! My husband is the opposite and we still spat over it! I want everything in perfect order and he's more "go with the flow" - drives me a bit crazy at times. Maybe the secret is somewhere in between being a control freak and being a happy hippy? It's finding that balance that's the tricky part - good luck! PS I don't know why it decided I was an "unknown" in the comment above! It is the number three -- Thinking and Worrying -- that I need to quit now. I tend to think too much, on how something should be done, which way will be the best suited for someone, what if it is not convenient for someone. I just need to do it, and stop thinking and worrying too much. Hi Pradeep - I'm the same - trying to have everything all worked out and perfect and going over and over it until I think I have it all sorted. The trouble is that life often throws a curve ball into the mix and all my plans didn't make it perfect. Sometimes just doing our best and letting the rest play out as it wants to is the answer - now we just have to learn to loosen our grip on things a bit! All your points are so real. Be looking for a feature on the next Blogger's Pit Stop. 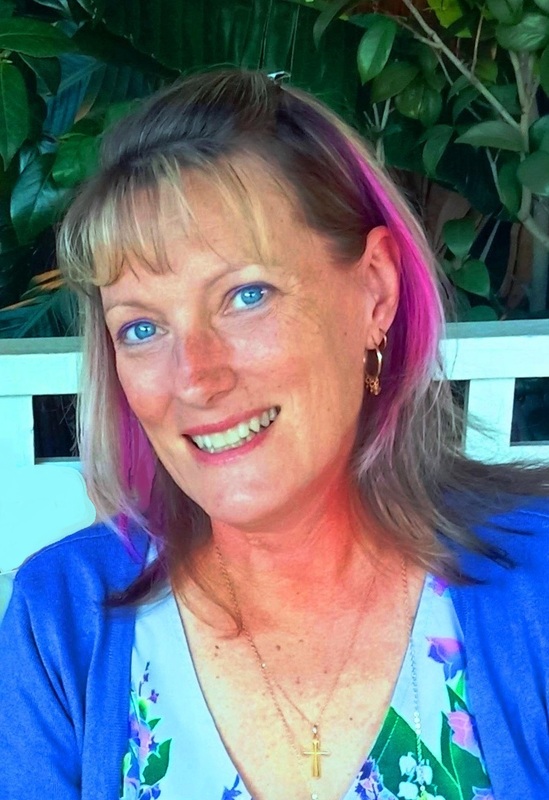 Kathleen I was so pleased to see you feature my post on the Pitstop - it's such an important group of unnecessary behaviours that we cling to for unhealthy reasons. The freedom of letting them go is priceless - and I just wish I'd begun the process a couple of decades earlier - but it's never too late to make a start! Leanna I love this list and can think of a few people close to me who should also read it. It is so true that as moms we tend to want to control everything. I have since tried to look at the bigger picture and instead of micromanaging try to get a feel for the outcome of my behavior instead. Micro-management has been an issue for me over the years too Mary - it's easy to do when the kids are young and you're trying to keep all the balls in the air, but as things become more divergent it gets harder to herd those ducks back in a row. I'm trying to reassure myself that the ducks aren't all my responsibility and it's okay to let a few wander off - they'll come back if and when they want to! Hi Jean - overthinking and worrying are big ones for me too - I'm trying to train my brain to recognize when I'm doing it and to consciously redirect my thoughts. It works sometimes, but often I drift back and have to repeat the process! I'm so glad you enjoyed the post - it's certainly one that came from my heart as well as my head!